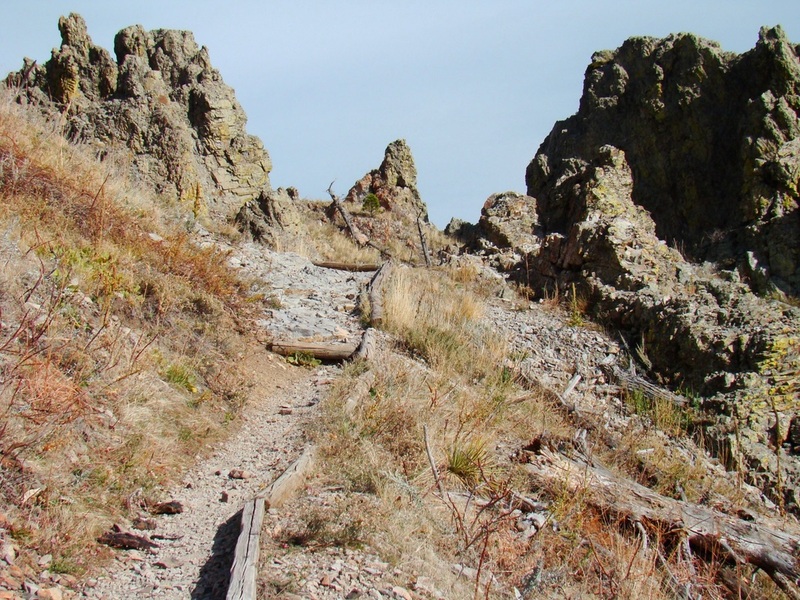 This is one of my “top ten” hikes for the Black Hills region. 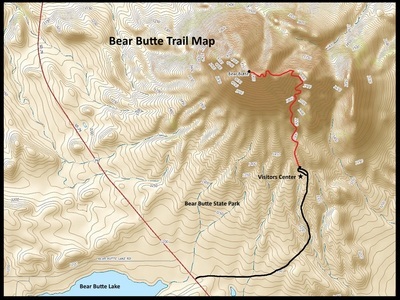 Because the 1.85 mile trail ascends 1,000 feet, this is not an easy hike. But it is certainly in range of intermediate hikers and I have witnessed families with small children making the hike to the summit. 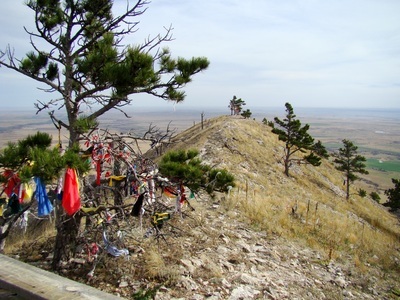 The trail to the summit of Bear Butte is the northern end of the 111-mile Centennial Trail, #89. Hikers climbing during warm months should always be alert for rattlesnakes. The trail is narrow and is rough in places. 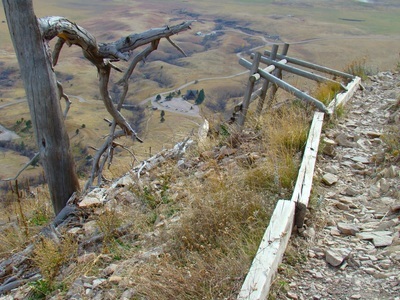 Some segments are steep and there are railings in a few places. 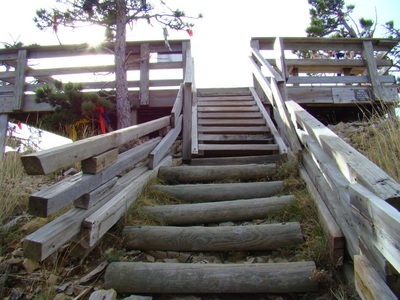 At the summit, hikers will find a large wooden observation deck and more official regulations signs. The lack of shade trees plus mid-summer heat can quickly dehydrate hikers. So be sure you take plenty of water and sunscreen if you go during warm months. 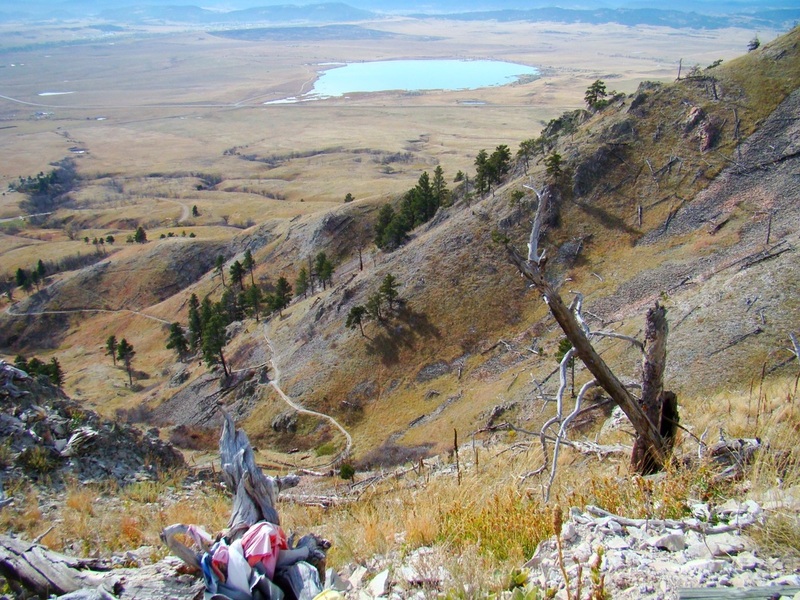 Because Bear Butte sits out and away several miles from the Black Hills, the views at the summit are some of the best in the region. One can easily see Terry Peak, Crow Peak and Custer Peak distinctly from the summit, plus far out into the prairie areas of South Dakota, Wyoming, Montana, North Dakota and Nebraska (only on clear days). Of course, good binoculars really help with this. 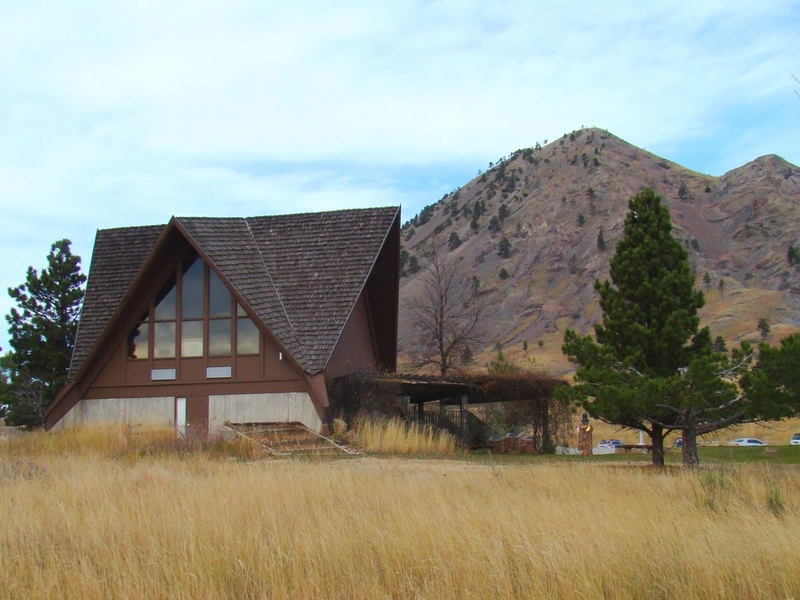 Bear Butte is located in the eastern portion of Bear Butte State Park, which is 8 miles northeast of Sturgis on Highway 79. 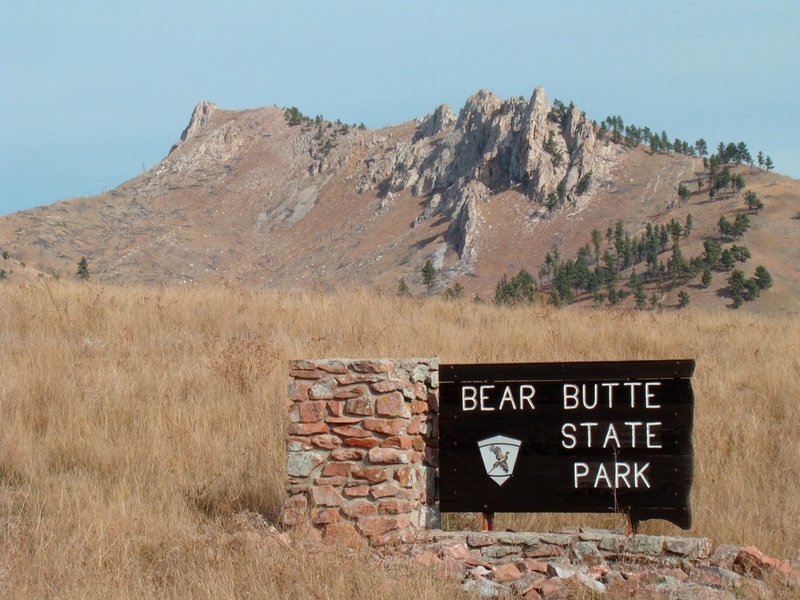 The west side of the state park is built around Bear Butte Lake and has a campground and a 2.5 mile hiking trail around the lake. A small herd of buffalo resides in the state park. 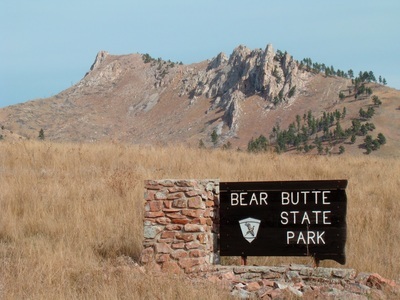 Bear Butte State Park offers a downloadable pdf trail system map plus state park info. 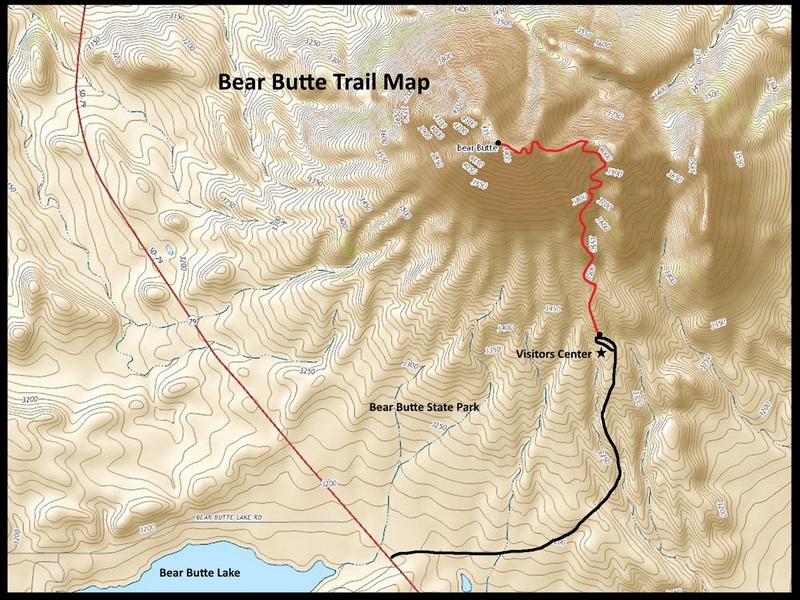 You can access that by clicking here: Bear Butte Trail System. A trail map is also included in the photos below. 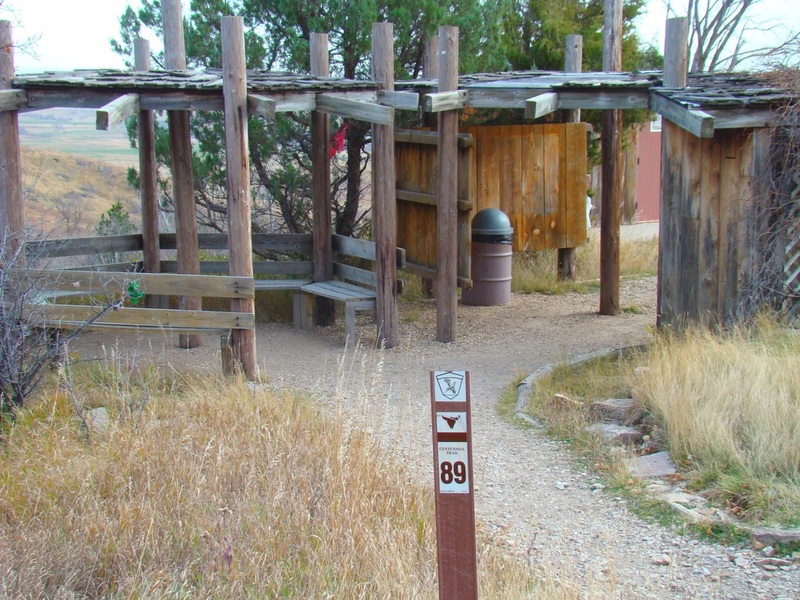 The park visitors center is closed during winter months. 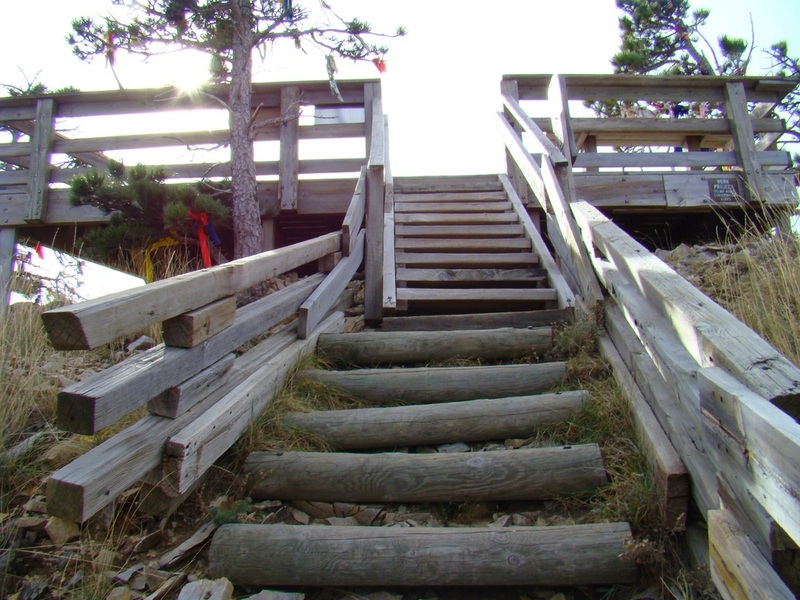 Visitors to the mountain will see Native American prayer cloths and other objects of worship. Signs are posted asking visitors to not disturb these. The Cheyenne tribe calls the mountain “Noahvose”, the center of the universe. The Lakota Sioux call the mountain “Mato Paha”, which means “Bear Mountain”. At one time, Bear Butte was covered by forest. In 1986, most of the trees were destroyed in a major forest fire. While re-growth has begun, it will be a very long time before it ever returns to what it was before.